Hi fellows! This is my contribution to this week theme in Take a Word: CELESTIAL. 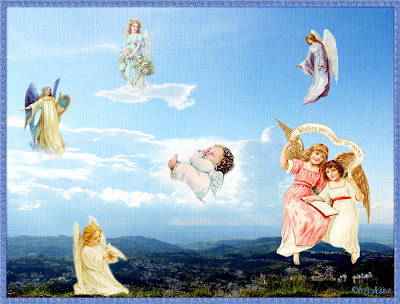 Angels: Dover and Graphics Fairy; Background is my photo of Serra Negra/São Paulo/Brazil. Angels are goods as gold in your heaven, love the images and your work. What a wonderful piece, Christine! I think it is very special! Heavenly music to match your heavenly piece, Christine! What a beautiful interpretation of the challenge, Christine. Sweet little sleeping angel! So very beautiful. Love your 'heaven'. so nice to see your heavenly scenario. our sky is dark grey right now and rainy, anything but summer! This is so sweet, Christine. I love how you have used a real photo. Oh Chris I love sweet little boy and all your gorgeous guardian angels...that's about how many I need to keep me out of trouble...well done my friend!!! So beautiful, Christine, and a lovely interpretation on the theme. It seems like we all need some angels watching over us lately. Wonderful collage!